Thank You Anuj Agarwal & Feedspot.com! 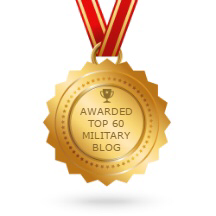 On April 12, 2017 I received an email from Anuj Agarwal of www.feedspot.com letting me know that my personal website has been named number 60 of 60 on Feedspot’s Top 60 Military Websites & Blogs For Military Professionals & Veterans. I want to thank Anuj and the Team at Feedspot for finding my content to be worthy of mention among a host of many other amazing websites. I look forward to next year, crossing my fingers that my new project, Divergent Options, will make the cut!